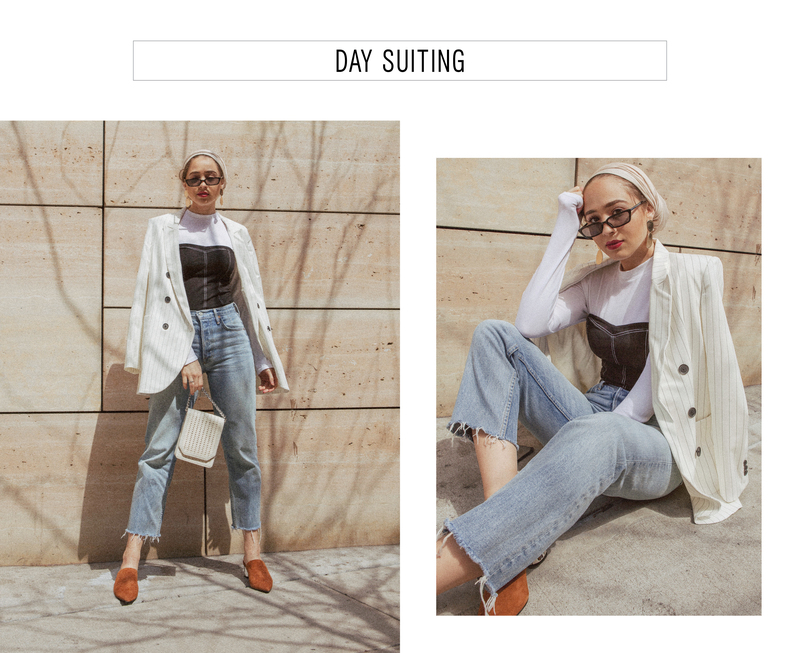 This week, the epically cool digital content creator and model Maria Alia shows us how a New York Girl effortlessly puts together suit separates. Her tips may not be right for a strictly business casual environment, but they are casually ah-mazing. Each look is paired, of course, with a chicly tied head scarf proving that great style—and really, these looks are trend-forward and spot-on spring—knows no limits. As a New York City-based digital style content creator and strategist, I constantly find myself styling certain trends in different ways to fit my varying needs. One of my current favorite go-to trends is occasion suits. Traditionally, the occasion suit has been reserved for the likes of corporate settings, professional meetings, events and interviews. More recently, we’ve seen this boss-lady’s wardrobe staple transcend these boundaries in the most interesting of ways. I decided to take on the challenge of styling this trend in 3 very different yet equally cool NYC-girl-approved ways. For the first look, I wanted to do a classic power suit with a twist. There’s something so commanding and bold about an all white suit especially paired with a matching white shoe. Yes, this color can be a bit daunting, so if you’re hesitant to try an all white look, you can always opt for a different colored shoe or break up the monochrome with a waist belt. I decided to go with a black turtleneck and clutch for some contrast. I finished everything off with a statement eyeshadow to really make it a look. This was definitely the easiest look to style because it is a matching set, and, man, do I love a good matching set. This is the perfect boss lady look, it’s what I’d wear to meet a client or even for a professional and formal evening event. For the second look I went for something more relaxed with a cool daytime feel which is hands down my favorite way to style suit separates. Pairing a blazer with denim strikes the perfect balance between relaxed and polished. A trick to keeping cool is to drape the blazer over your shoulders for an element of effortlessness. There’s also something to be said about the juxtaposition of a raw edge denim alongside a structured suit blazer. I fell in love with this Express One Eleven tube top and knew I had to figure out a way to style it. It adds a really interesting feminine touch to the look and could even be worn on its own under the blazer if you want to show a little more skin. This look is perfect for casual meetings, hangouts, or even work if you happen to work in fashion. For the final look I wanted to play with a pair of smart boot-cut suit pants. I decided to dress them down with a chunky pair of athletic shoes and add a touch of edge with a chain accessory and micro sunglasses. I love mixing trends and styles. I think pairing pieces that you wouldn’t initially think “go together” is the best way to create a cool look. I tied finished it all with a smart button down for added layer of contrast. This look is a city girl’s dream because it strikes a balance between comfort looking put-together. Definitely something I’d throw on for an afternoon of content creation and exploring lower Manhattan.